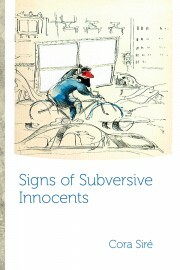 What is remarkable about Cora Siré’s poetry collection, Signs of Subversive Innocents, is both the breadth and the depth of the work: depth because so many of the poems are about much more than you think at first, and breadth because of the wide variety of subjects and issues that are addressed. There are poems about passion, rubbish, the carnal and the pure, death, irony, faith, music, dreams, art, bicycles, the politics of resistance, and more. In addition, the poems take the reader to different times and places—Hué, Buenos Aires, Franco Ontario, Mont Royal, Vermont—where you might laugh or cry, celebrate or mourn, but always, where you are rewarded with a deeper knowledge of things that are important both to you and to the world, a knowledge for which you sense the poet has fought hard, or that others have. Not only is there a wide breadth of subject matter, but the collection contains poetry of many diverse styles. I found this refreshing since certain poetry collections can feel a little dull to me after a while if the types of poems and topics they address tend to be too similar. Although I cannot name all of the styles used in the collection, some of the types of poetry I noticed included concrete or pattern poetry, list poems, prose poetry, free verse, refrain poetry, lament, and (I think) eclogue and verse paragraph. Despite the diversity in style, place and subject matter, the other thing that is great about this collection is how it functions as a whole. There is a certain underlying structure that, while I can’t describe exactly how it works, leaves the reader satisfied. I found myself thinking that yes, there is loss and injustice and ugliness in the world, but there is also art and beauty and love, and it is important to continue the struggle for these things, and for people to write beautifully about these struggles.